With India opening up its defence sector to private companies, an Indian company, Reliance Infrastructure, is seeking Russian assistance to build nuclear submarines and stealth ships, a newspaper report claimed. The Indian company Reliance Infrastructure is seeking a Russian partner to launch a joint venture for the construction of nuclear submarines and ships with stealth technology, the newspaper Economic Times reported on May 22. According to the newspaper, the company's top managers have already met with senior representatives of the Defence Ministry in Moscow. A source close to the negotiations said they would visit Defence Minister Sergey Shoigu and name a potential Russian partner with the necessary technological expertise. According to Lenta.ru, the Russian design bureau (DB) ‘Malachite’ (which built new submarines under Project 885 “Yasen”) said, with the approval of the government, it was ready to participate in this project. “Our design bureau has all the necessary competence and resource. Our DB designed the nuclear submarine, which is currently leased by India,” the portal quoted the ‘Malachite’ representative as saying. Is cooperation between Russia and India in the field of construction of modern submarines and surface ships really possible? According to Alexander Khramchikhin, deputy director of the Institute of Political and Military Analysis, Russia has never sold nuclear submarines to India, but has only given them submarines on lease or for rent. “The major problem that we face today in the construction of ships, both surface and underwater, is shortage of production capacity,” Khramchikhin said. “Thus, in theory, we may be interested in building surface ships and submarines in Indian shipyards, especially considering that the Indians build their own submarines. That is, in case there is space, because the Indians are going to build six non-nuclear submarines equipped with air-independent power plants. But that is another question,” he said. 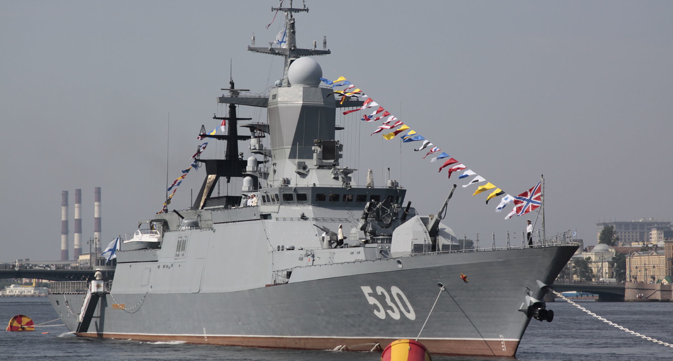 The President of the Academy of Geopolitical Problems, Captain 1st Rank Konstantin Sivkov, indicated that stealth technology in the Russian Navy is represented by the frigates Project 20350 and corvettes Project 20380. “Between Russia and India, there is an agreement on military-technical cooperation. Our countries have a wealth of experience in joint development of arms and military equipment, for example, the anti-ship missiles ‘BrahMos’. India seeks to build its Navy independently without purchasing ready ships from other countries. Russia is rich in technologies, so the desire of India to establish a joint venture with Russia for the construction of nuclear-powered ships and surface ships of the latest projects is only natural,” Sivkov said. “It is clear that the joint venture will be organized not with a private, but with the state enterprise. Should some private enterprise be created, it will be merely a cover for a state company, nothing more. And the possible meeting of the representatives of India with the Defence Minister is a logical step, meaning that we are talking about an absolutely legitimate way of military-technical cooperation,” he said. Igor Korotchenko, Chief editor of ‘National Defence’ magazine, and director of the Centre for Analysis of World Arms Trade, believes that the Economic Times story could be either stove-piping or probing. “Accordingly, cooperation with India can be carried out in other areas of the complex defence programs of short and medium range. Israel has become very active in the Indian market now, offering a variety of joint programs in the field of air and missile defence, but this is an area in which Russia is not only on par with the United States, but above,” Korotchenko said. Captain (1st rank) Boris Usvyatsov, head of the expert council of the State Duma Defence, Candidate of Military Sciences, noted that this issue is primarily political, since strengthening of India’s military power is always unnerving to China. “Of course, Russia's participation and the transfer of some technologies to India is possible, given the long-standing relations of Moscow and Delhi, but the construction of surface ships and submarines for the Russian Navy in the Indian shipyards is out of the question. According to the regulations of State program of arms, we build our ships only at home,” Usvyatsov said. First published in Russian by Svobodnaya Pressa.